In May 2009, Michael O’Hare ended his years of “silence” regarding the accusation that he is the notorious Zodiac killer. In an article posted on the website for Washington Monthly, O’Hare described his experience as a Zodiac suspect. Sometime in the early 1980s, when I lived in Cambridge, Massachusetts, I received a postcard with a name and return address I didn’t recognize, bearing a cryptic image on the back. Every few weeks after that I received another card. There was one with holes punched in it, one with a symbol that resembled crosshairs, one with a picture of a man in sunglasses and a hooded sweatshirt, and one with a string of binary digits. The return addresses and postmarks kept changing. Assuming a friend from college was trying to get me to play some sort of puzzle game — a recreation for which I have no patience — I threw them in a drawer, a little guilty that he was going to all this trouble. Then I received an article reciting details of the unsolved “Zodiac murders” that had unfolded in Northern California more than a decade earlier. In an episode that has since been recounted by countless journalists and Hollywood filmmakers, the killer had ambushed and slain five people. (The murderer has never been identified for certain, although numerous people have claimed to pinpoint the culprit — including a San Francisco woman who held a press conference in April declaring her father was the Zodiac killer.) He then sent letters to Bay Area newspapers threatening to kill many more unless they published a series of cryptic symbols, an act that created widespread panic. Included in the article I received were descriptions of the symbols, which sounded just like the ones on the postcards in my drawer. “Holy cow!” I said. “I’m getting mail from a mass murderer!” I called the local FBI branch, and a nice young woman with an FBI badge came to my office, picked up the collection of mail, said thank you, and left. The agent then explained that the mail was from an amateur sleuth in California named Gareth Penn, who had been trying for some time to interest the police in the idea that I was the Zodiac killer. Perhaps he was trying to alarm me into confessing or doing something incriminating. Who knows. Even today, I know little about the man, beyond the odd detail I’ve picked up here and there — like the fact that he is a librarian and surveyor by trade, that he has (or had) a wonderful Jesus beard, and that he is a member of Mensa. About the details of Penn’s theory, I know next to nothing (curious readers could find them in Penn’s two self-published books on the subject), except that it has made me the subject of a particularly bizarre and vacuous chapter in the annals of American criminal justice. I don’t want to be cute about the murders, which not only left victims and grieving relatives in their wake, but also frightened a lot of people, and frustrated California and Massachusetts law enforcement. So, for the record: I am not the Zodiac killer, had absolutely nothing to do with those (or any other) murders. As far as I know, I wasn’t even in California when any of them happened. Similarly, I had nothing to do with the death of Joan Webster, a Boston college student whose murder Penn has also tried to pin on me. A note to Zodiac hobbyists and Penn aficionados: Please don’t bother parsing the foregoing for cleverly worded nondenials and numerological incriminating clues; if you don’t like my choice of words, feel free to make up other language that you would take as a flat, comprehensive, unqualified denial, and assume I said that. What follows will tell you nothing at all about Zodiac or Webster; it’s a personal history of being struck by low-voltage lightning out of a clear blue sky. The decades since Penn fixed his sights on me have not been a living hell, much as that would spice up this story. They have been an ordinary life, punctuated by one or another flurry of fuss from Penn, sometimes involving pages of numbers (for example, the data pages from my PhD thesis) with this or that sequence picked out, circled, and “decoded” into words that fit somehow into Penn’s model of the crimes. As I understand it, Penn first decided I was the culprit after analyzing the Zodiac’s messages to the San Francisco Chronicle and determining that the murderer was an artist with the initials HOH, whose crimes formed, on a map, some sort of graphic having to do with a radian (the angle formed by laying a circle’s radius along its circumference, about 57 degrees) and Mt. Diablo, a Bay Area landmark. There is also something about water, whose chemical formula is sometimes written HOH, and my initials (my middle name, which I rarely use even as an initial, is Henry). Before approaching me, Penn apparently made himself a nuisance to the California Department of Justice. Early on I was in touch with a nice investigator there named Fred Shirasago, who knew Penn’s father and could sometimes get him to make his son stop harassing me for a while. But I guess when you know something terribly important that the entire world thinks is hooey, it gets harder and harder to let it go. My favorite episode was the phone calls. Sometime in the 1980s, I started getting them at two and three in the morning. When my wife or I answered, a male voice would say something vaguely threatening like “I’m coming north, and I’m going to get you soon!” We told the Brookline police about it, got them to drive by more frequently, and eventually it stopped. I only discovered the reason for the calls much later, during one of my occasional trolls through the Internet to see if I’m still of interest to Zodiac amateurs. The calls were supposed to be transmitting coded messages via numbers — in particular, the time of the call! Apparently, Penn’s assumption was that when the average person is aroused by the phone in the middle of the night, the first thing he does, before woozily answering, is to note the time of the first ring on the digital clock he keeps by the bed — which is, of course, synchronized with the clock in the Naval Observatory. If your clock (or his) is off by just a couple of minutes, the call that was supposed to register as “2:14” — code for “Got you dead to rights this time” — will be misinterpreted as “2:16,” which I think means “The Sox can’t make the playoffs without a closer.” (Sadly, I’ve lost the magic decoder ring I got in exchange for cereal box tops as a child, so I can’t be sure.) 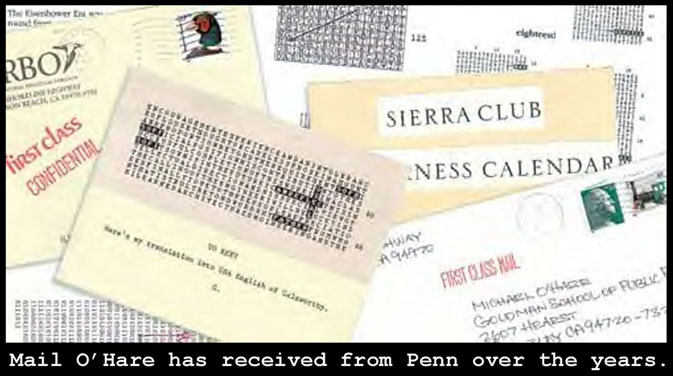 The story got even better years later, when I discovered that a Penn skeptic had been calling him at home at times that figured into Penn’s theory, whereupon Penn assumed the calls came from me and “returned” them to my house, so he thought he was having a conversation with me, all in three-digit numbers. During the era of late-night phone calls, I got the impression — how, I no longer remember — that Penn was also trying to get volunteer vigilantes to visit summary justice on me. (Penn has said in his own writing that he was contacted by would-be vigilantes, but when he found out what they were after he had nothing more to do with them.) One of my friends suggested I might want to get a license and carry a gun. I entertained the idea for about five minutes, but decided if I let Penn affect how I lived in any way — and carrying anything more dangerous than a Swiss Army knife is far from my idea of normal — there would be no end to it. Anyway, expecting to get the drop on some stranger who came after me with murderous intent was obviously ridiculous: being shot trying to get your piece out of a holster is not much better than just being shot. 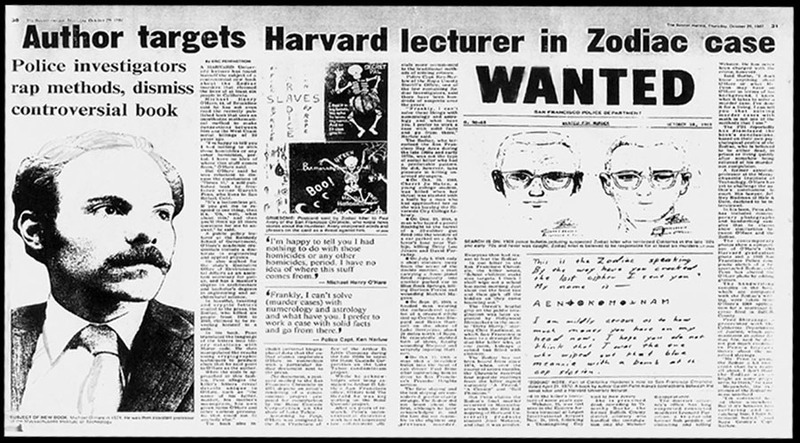 The Zodiac business occasionally broke into public view, most weirdly in 1987, when the Boston Herald published a front-page story, “Author Targets Harvard Lecturer in Zodiac Case.” A dumbfounded friend showed it to me when I arrived to work at the Kennedy School of Government, and I braced for a rash of headlines. But that was it: one story without a column inch of follow-up, a day of people being nice to me (the Herald is not, shall we say, the Lexus of the Boston press), and perhaps a few colleagues giving me extra space to pass in the corridor. This was thanks in part to Marvin Kalb, a veteran television journalist who was on the Harvard faculty and gave me some good advice about how to handle media calls: I wrote a boring denial and offered it to reporters requesting interviews. They all lost interest, except one nitwit who called me to ask questions about the Zodiac case itself. On another occasion, a morning radio host in Los Angeles invited me to be interviewed on his show about some city planning issue. When I called in, he asked two or three clueless questions about housing, and then blurted out that he had Penn on another microphone. Apparently, he thought he was a junior Geraldo Rivera doing an ambush interview, which, naturally, would segue into a debate about whether I had killed six people. I got an apology from the station manager for that. I’m a little sore at the lawyer for having discarded my file a few years later in an office cleanup, but as Penn keeps sending me the odd mysterious letter or postcard, I’ve accumulated another whole folder of truly bizarre correspondence for my biographer (or Penn’s) to enjoy. And the lawyer’s advice turned out to be sound. Indeed, the constant of this story is that, as far as I can tell, not a single person who matters in my life — not law enforcement, not friends and family, not students, not colleagues — ever gave Penn’s views a minute’s credence, so I’ve never regretted not lifting a finger to refute them or defend myself. Recently I asked my wife and daughters about how they have taken this whole thing. Daughter number one, the earnest save-the-world schoolteacher, was outraged that anyone could say such awful untrue things and not suffer any consequences. She still worries that people she doesn’t know might suspect me of the crimes. Daughter number two, the free-spirited writer, loves weird, off-center stuff and browses the Internet occasionally to see what Penn is up to now. My wife first thought it was silly, then was a little afraid when Penn’s fans appeared willing to take the law into their own hands, but now looks back on the whole ordeal as just an irritating distraction. I’ve never apologized to them — but what would I apologize to them for? My initials? Over the years, I’ve gotten the occasional whiff of how hard Penn was working on his project and the kind of evidence he had collected. For instance, I spent a summer in San Francisco — in 1969, I think — working at Arthur D. Little, Inc., on a study of expanding the San Diego airport. This emerged from Penn’s analysis as having been a ski condominium development in Lake Tahoe (a project I had had nothing to do with); how it connects to the crimes I have no idea. Later, he predicted that Webster’s body would be found at a specific location in the Boston suburbs, and, I believe, cruelly misled her poor parents for some months (she was later found many miles away). At another point, he thought I had buried her on property I owned in Vermont. Once when I was there, tending the garden, I looked up and saw a small plane flying low overhead. An aerial photo of the house later appeared in my mailbox back in Brookline, without comment. (I think it was sent by Penn; most of the mail I believe I’m getting from him is in unmarked envelopes, or signed by various people named Mike.) I understand Penn also predicted that I would commit suicide in a particular way on a particular date, but I was not informed in time to comply and am now many years overdue. By contrast, things I have intentionally crafted have been mostly ignored by the Penn-Zodiac crowd. Although I write for a living, only my dissertation (tables and tables of numbers!) and two other works have attracted their interest. One of them was a paper that used a hypothetical carjacking to illustrate something about persuasion; the other was a satirical op-ed I wrote for the San Francisco Chronicle that used Canadian wolf relocation to make fun of xenophobia. I thought it was a pretty minor effort, but it echoed through the recesses of the Internet for years. If only I could get fellow scholars to pay half as much attention to my serious work. I have a recurrent mental image of Penn (whom, to my knowledge, I’ve never met). He’s seated cross-legged on the floor surrounded by an enormous collection of Lego pieces, each one a fact either about me or about the Zodiac/Webster crimes. Hour after hour, day after day, he assembles an amazing structure, but the pieces from the two batches don’t fit together properly, so he relabels something that looks useful, or whittles a new piece from scratch into the shape he needs. Everyone should have a hobby, I guess, and the world has survived a wide variety of philosophies about the relationship between belief and evidence. But all in all, I wish he had gone looking for a race-car driver with the initials PDQ. – Michael O’Hare teaches public policy analysis at the University of California at Berkeley, specializing in environmental and arts policy with forays into public management. According to one theory, Gareth Penn and Michael O’Hare worked together to commit the Zodiac crimes and were assisted by their parents.